Your palms are sweaty. Your pulse races when you hear the news. You’d do anything for a few more hours to prepare and you might work all night. It’s TMF inspection day and now it’s too late to make a meaningful change. At LMK Clinical Research Consulting, we know the toll TMF stress can take on your team and your health. TMF stress damages the fabric of your team, erodes job performance, stokes burnout, and ultimately endangers the health of the TMF. But, beyond addressing resourcing and TMF training concerns, mindfulness-based stress reduction (MBSR) can be an indispensable tool for fighting TMF stress and disharmony. LMK’s TMF Mindfulness Series gives practical advice, allowing you to incorporate the seven pillars of mindfulness into your TMF processes. Click here to read our last post in the Mindfulness Series introducing the mindfulness concepts of the beginner’s mind, trust one’s self, and the non-striving TMF. There are many negative stimuli in life that cannot be avoided: a headache, a diagnosis, an accident, an embarrassing moment. These inevitable calamities come with feelings of pain, fear, uncertainty, and grief. The pillar of mindfulness, acceptance, challenges us to come to terms with these moments as they truly are, so that we may take control of our emotional reactions to them. Acceptance does not mean resignation. The acceptance pillar of MSBR can be best thought of as self-acceptance. Much like non-judging, acceptance asks us to observe our current experience and resist the urge to immediately judge it as good or bad. Beyond resisting judgment, acceptance means truly experiencing the present whether pleasant or unpleasant. When we do feel the pain of a headache, for example, we expend so much of our mental energy fighting the pain and wondering “Why me?” The accepting mind, in contrast, accepts these negative sensations as they unfold and avoids a vicious cycle of distressing emotions. Even with the pillar of acceptance we must take ownership of our actions regardless of their consequences. 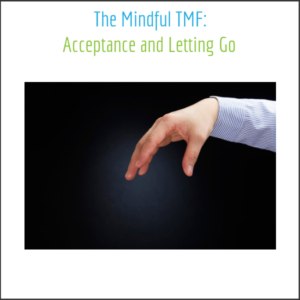 For the TMF professional, faced with the stress of an unhealthy TMF, acceptance means letting the impulse to assign blame or to react with anger pass over – and then taking appropriate action. Acceptance is an important MSBR practice because of how it allows us to respond appropriately to the present. The suffering that comes from the inability to accept our challenges as they truly are magnifies our suffering, blunts the healing process, and sows disharmony in our relationships. Disharmony among the TMF team prevents the team from fully understanding the condition of the TMF and thwarts unified action. Resorting to denial, anger, or assignment of blame about the state of the TMF may seem the only way to show “commitment”. These short-sighted emotional reactions, however, are passivity in disguise. Life does not stand still. No matter how hard we try to resist, the world changes in ways that constantly impact our outer and inner experience. Despite the reality of change, those who first begin to practice MSBR will notice that the mind has many thoughts that feel permanent. The effort required to hold on to – or resist – these trapped thoughts can create undue stress and interfere with our relationships. Much as the pillar of acceptance asks us to impassively observe the present to bypass unhealthy emotions, the pillar of letting go asks us to let these stubborn thoughts change with the present so that we do not remain with them in the past. When working with the TMF, we can get stuck on past experiences and expectations. As the story of a clinical trial unfolds and regulatory expectations increase, what was once acceptable may now be unacceptable. MSBR calls us to question the old way of doing things and turn our attention to the present time. Perhaps the greatest recent example of change in clinical research is the shift from paper TMF to eTMF. Some organizations have successfully adapted to the new eTMF paradigm, while many have struggled. Letting go, for those transitioning from TMF to eTMF, could mean replacing outdated knowledge and processes through eTMF training, but could also mean asking for outside help. In the event an eTMF is truly struggling, sometimes the best course of action is to let go of the desire for control and seek out an eTMF expert. Each of the seven pillars of mindfulness challenge us to face the present with an open mind and heart. Facing the present in this way, at work or at home, may not be easy or natural, but the peace and clarity offered by MSBR are worth the effort. We hope you’ve enjoyed LMK’s Mindful TMF series and would love to hear more about how you plan to incorporate MSBR principles into your own TMF processes. Armed with the seven pillars of MSBR, along with the right people, processes, and tools, we are confident that you can turn TMF stress into TMF success.